Oh we had such a lovely time in St. Petersburg. I think it's due in large part to David's thoughtful planning. You're a great host, David! We borrowed bikes from friends Clinton and Karen (thanks, guys!) and headed to the same area we'd been the day before, downtown St. Pete by the bay. A huge Saturday market was going on. We poked around there, then rode the paths along the waterfront. That evening we headed over to the beach to eat dinner at Snappers, a fabulous seafood restaurant. Though it's fun to be with all our kids at once, it's special to have one-on-one time, too. 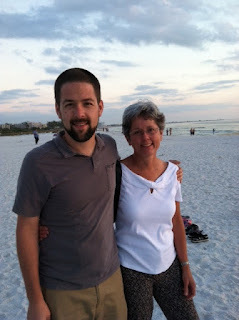 We so enjoyed watching the sun set over the Gulf of Mexico, followed by a leisurely and delicious dinner with David. Such a blessing. Beach. Why do I love the beach so? Check this out! While home in Ohio for Christmas, David sorted, boxed and loaded the last of his childhood stuff, including a bulging baseball card collection. About a year ago he began asking about our old stereo/turntable and records. It turns out, we had TWO turntables in the basement. He and Katie dragged them out and discovered they still work and we said sure, you can have it all. So we drove the whole lot down to Florida .. baseball cards, records and all. Here's David, spinning "Aztec Two-Step" .. does anyone remember those guys from the 70's? We also enjoyed some James Taylor, Neil Young, and Beatles during our visit. Amazing! This stereo pre-dates ME in Bill's life! A little odd but fun to see our son enjoying it. 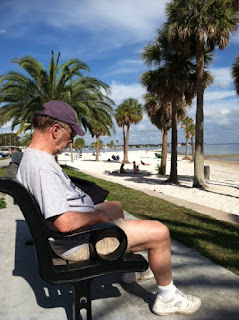 in January, so we headed for a park along Tampa Bay. Honestly, I could have pitched a tent there for three days and been content. David and I set up shop on the sand. I'd brought a book but couldn't read. That evening, David hosted a cookout/potluck at his house to introduce us to some of his friends ... all great people from his church. 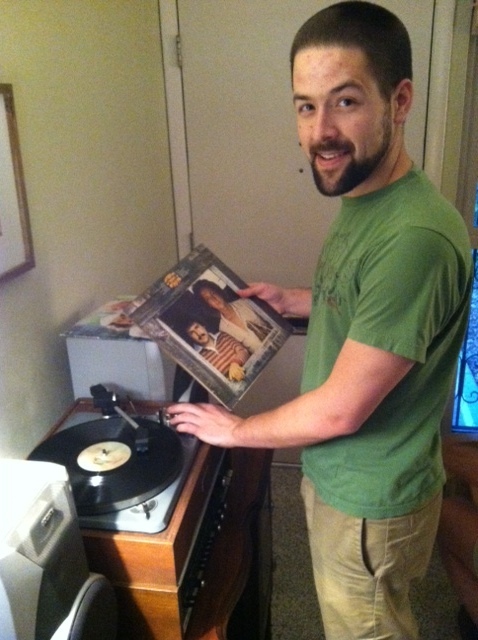 It was a lot of fun, and of course we played records and reminisced over Neil Young's great music! ... bikes and beach and sweet time together. We set out from the east coast to the west coast of Florida on Thursday, January 10.
forever! Kind of liking life on the road. Knowing how cold it was back in Ohio didn't hurt! We arrived at the "Trop" around lunch time and met up with David. 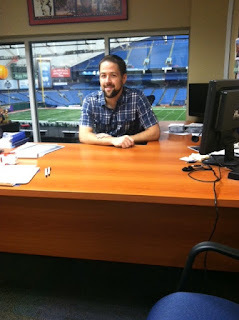 Trop = Tropicana Field, home of the Tampa Bay Rays, where David works. snapping photos in son's workplace. But how 'bout David's office?! He loves his job ... for that we're thankful. in the house he bought a year ago. What a beauty! tree out front which shades almost the entire property all day. David's learning all sorts of handy-man skills from friends and neighbors. More from St. Pete tomorrow! on a cold and snowy night. we'd just moved to a new town and Bill had started a new job. Money was scarce, but love was plentiful! Dan was a boy on the go: an imp who kept our lives hopping. having lunch on our porch in Defiance, Ohio. At that age, Dan was usually in motion, so I love this peaceful shot. Now Dan's in that same season of life we were in 28 years ago. He's a husband and father: he and Jenny are expecting a son in May! On our last day in Jensen Beach, we met up for brunch with dear friends Steve and Grace. Oh, do we have a history! We met Steve and Grace when we first moved to Florida and were newlyweds. Their children were young, so we'd spend evenings playing Password after the children were in bed. They showed us how to love, live and forgive as a married couple. They shared meals, laughter, and even their home with us when a hurricane struck. Our friendship continues after almost 35 years. A shared brunch was wonderful, though way too brief. Love you, Steve and Grace! Next up: across the state to visit our oldest boy! 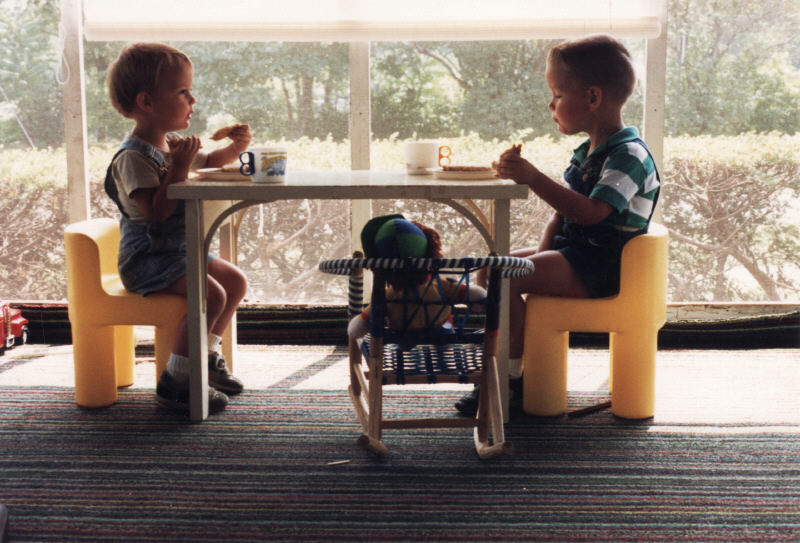 We were up early for coffee and a quick breakfast with my brother before hitting the road. Roughly 400 miles lay between us and our destination on the east coast of Florida. After a quick stop in St. Augustine to say hello to Bill's brother Bob and wife Tracy, we were back on the road. How I love driving south in January, leaving the frigid midwest behind. With every mile the temperature rose and I cracked my window open a little more. The soft scent of ocean and vegetation took me back to our early married days in south Florida. We arrived by dinnertime at the home of Dan and Beth, dear friends we have known for over 30 years. They live in the cute little town of Jensen Beach, which in some ways reminds me of our Ohio hometown, plunked down on the coast of Florida. Beth and I hopped in the car and took a walk through a gorgeous park near the water. (The St. Lucie River, I believe ... which I kept confusing with the Intracoastal Waterway.) I oohed and aahed the whole time. The wind, the tropical warmth, the foliage all felt pretty close to heaven! We made homemade pizza for dinner and enjoyed catching up on life. It rained the next day, but we were there more for the company than the beach and had a great day, including a rainy stroll in downtown, adorable Jensen Beach. Dan grilled a salmon filet that night ... out of this world! Then we played a rousing game of Sequence. What is sweeter than fellowship with dear friends? Thank you, Dan and Beth, for your warm hospitality in your warm, sunny climate! Tomorrow: a visit with more friends. The Low Country's personality is a palette of changing textures and tides. Pat and Janet's house overlooks a tidal marsh, its appearance constantly changing with the tides. Water birds and alligators make their home there and palmettos line the roadways. Nearby is the Atlantic Ocean﻿, sending sea breezes over the island and marshes. I find it an untamed and magical place. Janet was out of town, but we enjoyed a lasagna dinner with Pat and my niece Sarah. How wonderful to see her again after several years. At 25, she's poised and focused. Love you, Sarah! Love you and good to see you, big brother! Bill with Ari and Ashlyn in their castle. Love it! We set out. Thursday, January 3, my birthday. Typically, we tackle the 8-hour, 456-mile drive by leaving early. And we usually hit rush hour at one end or the other, Columbus or Charlotte. That day we left about 10 a.m. for reasons I'll not go into. Oh, and we were two cars: Bill and I in the minivan loaded with David's stuff bound for Florida, and Katie in the Civic, bound for her new/temporary home in Charlotte. It was a drive made longer by a big fat back-up on I-77 south of I-81 in southern Virginia. I don't see why the closure of one lane creates such an insane back-up of traffic. Just keep moving, people! This is what keeps us going ... knowing these darling girls are waiting in Charlotte. Ari turned three on New Year's Day. What a bundle of fun! She still calls Bill's beard "Popsy's feathers." Oh my goodness. Ashlyn looks to Ari for her cues. She wants and does and says whatever big sister says! 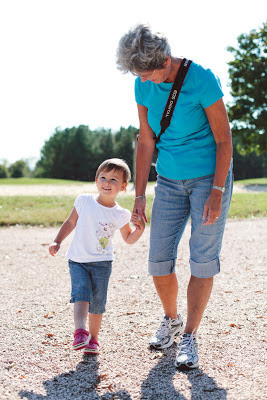 She also takes a shortcut and calls BOTH of us "Baba." Adorable. 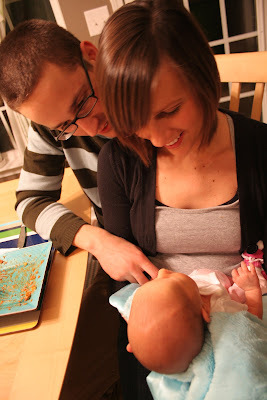 We spent three nights in Charlotte, visiting Dan and Jenny and playing with the girls. We hit the road again after church on Sunday. My oldest son, David, called two days before he flew home for Christmas. "It's definite. I'll be renting out the spare room on January 19. So if you want to visit, you'd better come soon!" David lives in St. Petersburg, Florida, and bought a house a year ago. We hadn't yet made it down but a trip was on the radar. We also had some deliveries to make. More on that later. So, in the hubbub of Christmas and kids coming and going, we sat down to plan a trip south: Ohio to Florida and points in between. Hooo boy! Line up a house/dog sitter. Contact friends and family we want to see along the way. Dig out warm-weather clothes. Get the car serviced. Target departure date: January 3. I like the seeing-new-places-and-visiting part of travel. But the getting-everything-ready part I detest. Usually I don't sleep well the night before. I become so emotionally frayed that I want to scrap the whole thing. Then we get on the road, Bill drives, and it's all good. So on Thursday, January 3, we set out in the mini-van. Katie followed us in her car to Charlotte, our first stop. And for two weeks we traveled, seeing some new sights, friends and family. It was really lovely. And not terribly tiring. In accepting that we couldn't always find our stuff, learning to use the map app (haha!) on my iPhone, and that cheese and crackers for lunch work just fine ... I think we found a rhythm of the road. ﻿ This year looks to be one of more travel for us. Our kids all live out of state. I still buzz down to Nashville to visit my dad. And some fun stuff in the works, too. If you've ever traveled with kids, you know it's sometimes a stretch to call it a vacation. With four kids, the challenges increased exponentially. More bathroom breaks, more Cheerios and toys on the van floor, more noise, more fights, more outbursts from mom: "do you want me to come back there?!" 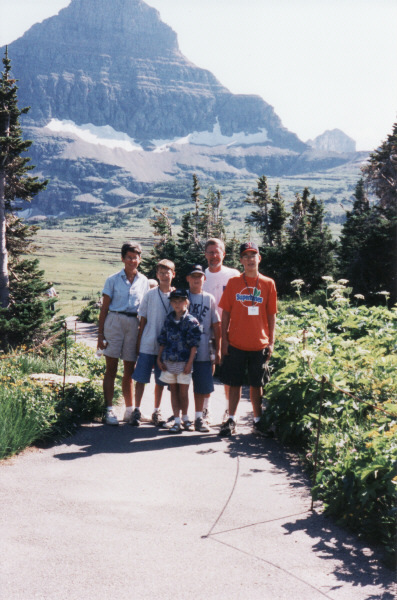 Now, as our kids have children of their own, they're getting a taste of the joys of traveling with children. But Bill and I are getting of taste of traveling without them. And it's pretty nice. We stop when we want, or don't. OK, our bathroom breaks might be more frequent, but no squirrely kids are yelling for stops. The Cheerios are long gone, as are the mountain of food to keep everyone fed. Hard-boiled eggs, yogurt and fruit fit the bill for lunch on the road. Since Bill loves to drive and I love not to, we're a good pair. He drives and I navigate, read, choose our music and nap. There are moments when I miss the exuberance of children in the car, and sharing points of interest with them. That season had its fun moments. But this empty nest season of small lunches and peaceful conversation is mighty sweet! and many stressful hours for the new parents. toddlerhood behind as she blossoms into a little girl. to listen to longer books, and recognize letters and numbers. Best of all for her Baba, Ari can have a conversation, exchanging ideas with me. when she is that magical age of nine or ten. and have tea parties and play dress-up. Baba loves you so very much!